Note that the road numbers changed in 2006 following the opening of the Baldock by-pass, and so may appear different in older road atlases! 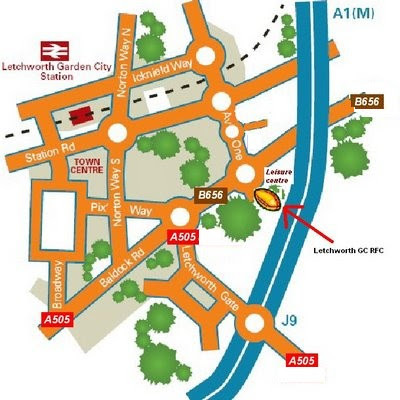 If travelling from the east it is quicker to exit the A505 before you get to Letchworth and go through Baldock than follow the by-pass. If you are using the A1 then leave at Junction 9, and follow the signs for the B656 and the leisure centre. Oh yeh someone else got a bit wet to!!!! Someone got a good shot!!!!! Carla, Hayley and the U14s - as seen on TV! Stevenage out of Herts 7s!